The foolish decision–by both the NAACP and the Obama administration–to accept the Tea Party movement’s severely edited and distorted version of Shirley Sherrod’s remarks should remind us of the importance of historical memory. Sometimes we need a certain amount of public humiliation to bring us back to first principles, such as the need to pay attention to the details of the past. I found confirmation of this inconvenient truth earlier this summer when my graduate students grumbled a bit after taking a final exam. Graduate students enrolled in history or humanities seminars are not accustomed to taking exams. Instead, they spend their time reading books and articles, writing papers, discussing concepts, and debating ideas. That’s the way it should be, but in this case—an unusual course entitled “The Civil Rights Movement and the Law,” there were ample reasons to make them answer a few test questions. The course was largely experiential, consisting of three nights of introductory seminars followed by an intense seven-day civil rights tour of the Deep South. The heart of the course brought them face to face with an array of movement veterans, ex-Freedom Riders, civil rights attorneys, federal judges, journalists, and ordinary Southerners, black and white. During five years of these summer sojourns, I have seen students undergo life-changing experiences as they confront the ghosts and survivors of the tumultuous 1960s. So I don’t worry as much as I normally do about facts and retention of detail. I asked them to read five books and two articles before our departure for Nashville, but I didn’t quiz or check up on them during the journey itself. Still, I wanted to encourage them to absorb at least some of the rich historical literature on the civil rights struggle–hence the final exam to be taken two weeks after their return. This year, question number ten read: “In the fall of 1961, _________, a SNCC staff member and former student at Virginia Union University accompanied Cordell Reagon to Albany, Georgia for the purpose of organizing a voting rights project in southwestern Georgia.” Many of the students knew the correct answer: Charles Sherrod. But a few minds went blank, even after reading vivid accounts of Sherrod’s exploits in two different books. Looking through the list of possible answers (I gave them a jumbled list of names), one desperate student put down “Marshall Dillon” of Gunsmoke fame, and another chose “James Weldon Johnson,” the Harlem Renaissance writer who died in 1938. After the exam, one student who did well on the essay questions but not so well on the objective part of the test, complained “Why do we need to know this stuff? Do we really need to remember the name of the man who led the civil rights struggle in Birmingham, or the Mississippi woman who spoke at the 1964 Democratic National Convention in Atlantic City?” Since we had all flown back to Florida from Birmingham’s Fred Shuttlesworth Airport and since I knew she had seen film clips of Fannie Lou Hamer’s famous speech, I was a little taken aback. But I tried to be kind and reassured her that I appreciated all of the hard work that she had put into the course and that missing those questions would not have a major effect on her grade. I should have been tougher. Looking back over the events of last week, when both the Department of Agriculture and the Obama White House rushed to judgment on the Shirley Sherrod affair, I have come to the conclusion that we should all take some time to reflect on the importance of remembering who did what during the civil rights struggles of a half century ago. This year marks the fiftieth anniversary of the Greensboro sit-in, and next year we will commemorate the fiftieth anniversary of the Freedom Rides, when Shirley’s husband Charles boarded a freedom bus for Albany. Sherrod is a very unusual name, which should have set off immediate warning signals among federal officials. But it didn’t. Even the most cursory fact-checking would have revealed not only that Shirley Sherrod was a dedicated and compassionate public servant but also that she had spent much of her life attached to one of the true heroes of modern American history. There is a public park in Albany named for Charles Sherrod and with good reason. He not only went to rural Georgia in 1961 to energize a regional movement for simple justice; he stayed there long after his fellow activists departed, working as a community organizer, serving on the city council, teaching at the local university, and ministering to prisoners as a chaplain . Amazingly, he is still there, after suffering imprisonment and risking his life more times than most of us can imagine. Now seventy-three years old, he is still searching for the “beloved community,” still fighting for the unrealized ideals that his old friend Congressman John Lewis tries to keep alive in the corridors of power. Few of us can ever hope to match Sherrod’s or Lewis’s contributions to freedom. But as citizens of an imperfect democracy we all share the responsibility of connecting the present and the future to a meaningful and usable past. Go to the library, buy a book, turn on your kindle, or take a course. But don’t let the deeds and sacrifices of the Charles Sherrods of the world escape your vision. Raymond Arsenault , the John Hope Franklin Professor of Southern History at the University of South Florida, St. Petersburg, is the author of Freedom Riders: 1961 and the Struggle for Racial Justice, and The Sound of Freedom: Marian Anderson, the Lincoln Memorial, and the Concert That Awakened America, both New York Times Book Review Editor’s Choice selections. FREEDOM RIDERS COMES TO THEATERS AUGUST 13! PREMIERS IN BOTH NEW YORK CITY & LA! Help spread the word & pack the theater! Freedom Riders is accepted into DocuWeeks! DocuWeeks is a theatrical showcase that helps documentaries qualify for the Oscars! Help spread the word & fill all 28 screenings! Producer Laurens Grant & Director Stanley Nelson In Person! Sat. Aug. 14: 1:45PM & 7:30PM – Q&A w/ Director Stanley Nelson after 7:30pm show! Sun. Aug. 15: 3:30PM & 9:35PM – Q&A w/ Director Stanley Nelson after 9:35pm show! Tues. Aug. 17: 1:45PM & 7:30PM – Q&A w/ Producer Laurens Grant after 7:30pm show! Wed. Aug. 18: 3:30PM & 9:35PM – Q&A w/ Producer Laurens Grant after 9:35pm show! Fri. Aug. 13: 3:40PM & 9:45PM- Q&A with Producer Laurens Grant after 9:45pm show! Sat. Aug. 14: 1:40PM & 7:35PM – Q&A with Producer Laurens Grant after 7:35pm show! With two special guests from the film, including a Freedom Rider! Sun. Aug. 15: 5:20PM & 9:50PM – Q&A w/ Producer Laurens Grant after 9:50pm show! FREEDOM RIDERS screens as part of the International Documentary Association [IDA]’s 14th annual DocuWeeks™, a documentary theatrical showcase designed to qualify films for consideration for the Academy Awards. This year’s selected films is a strong lineup of 17 features and 5 shorts to screen in New York City and Los Angeles. 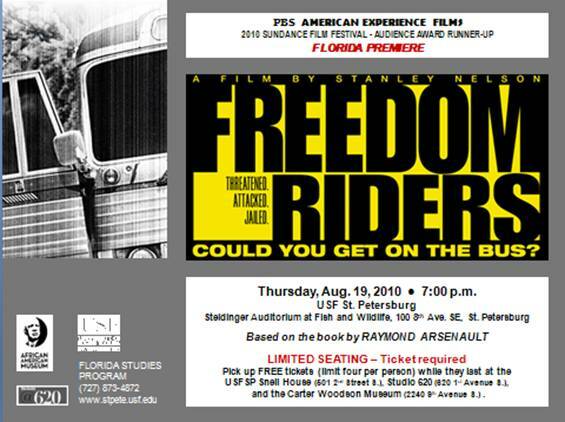 FREEDOM RIDERS is scheduled to air on PBS’ acclaimed American Experience series in May 2011 to commemorate the 50th anniversary of the 1961 freedom rides. FREEDOM RIDERSis the first feature-length documentary to tell the story of a courageous band of civil rights activists who risked death by daring to defy the laws of Jim Crow in the Deep South in 1961. They were America’s first inter-racial and inter-religious mass movement to challenge segregation in bus and train facilities. Because of their efforts, the signs "whites only" and "colored only" were taken down forever.